Microchip has announced the industry’s smallest IEEE 802.15.4-compliant module that combines an ultra-low-power MCU with a sub-GHz radio, accelerating time to market and providing long battery life in wireless-networked sensors. At half the size of the next smallest module on the market, the SAM R30 module (ATSAMR30M18) meets the needs of space-constraiined designs such as home automation sensors and controls. 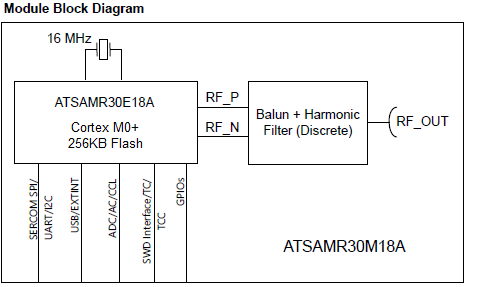 Based on the SAMR30 SiP (ATSAMR30E18A), which integrates a 32-bit Arm® Cortex®-M0+ processor and a sub-GHz radio, the SAMR30 module offers up to 256 KB of Flash and 40 KB of RAM, as well as serial data interfaces, USB, and digital and analog I/O for advanced sensor development. The SAM R30 module supports proprietary networks that can be easily customized and configured. This is ideal for applications where interoperability is not desired due to their inherent vulnerability to remote attacks, such as alarm systems, building automation, smart cities and industrial sensor networks. A key advantage of an IEEE 802.15.4-based network is that member devices can sleep for extended periods of time and remain part of the network. 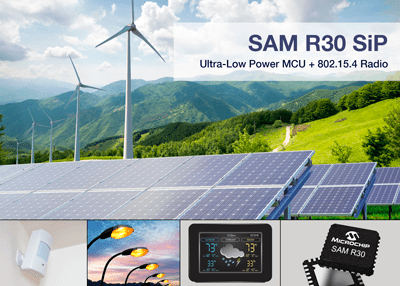 The SAM R30 module features ultra-low-power sleep modes, with wake from General-Purpose Input/Output (GPIO) or its built-in Real-Time Clock (RTC) while consuming approximately 800 nA. Devices can sleep for years, only waking as needed to transmit data. Compact sensor designs can significantly reduce installation components and simplify device deployment. The SAM R30 module measures just 12.7 x 11 mm and includes the necessary features to drive any remote connected sensor, thereby eliminating the need for a separate MCU in the design. The device also offers up to 256 kilobytes (KB) of Flash and 40 KB of RAM, as well as serial data interfaces, USB, and digital and analog I/O for advanced sensor development. Operating in the sub-GHz RF spectrum, the SAM R30 module delivers two times the connectivity range and better propagation through walls and floors than similarly powered devices using the 2.4 GHz frequency band. This robustness is critical in applications such as leak detection, where the sensor may be buried deep in a remote cabinet, or for pool and spa controllers, which require reliable sub-GHz solutions that can communicate through exterior walls. The SAM R30 module is certified with the Federal Communications Commission (FCC), Industry Canada (IC) and Radio Equipment Directive (RED), enabling designers to reduce time to market and RF testing certification costs. Microchip provides developers the flexibility to implement a proprietary point-to-point, star or self-healing mesh network configurations with the free MiWi™ protocol stack. The SAM R30 module joins Microchip’s IEEE 802.15.4-compliant wireless portfolio. With devices that meet the unique needs of a variety of applications, developers can select a single-chip 32- or 48-pin SAM R30 System-in-Package (SiP) for flexible design layout or the certified SAM R30 module for fastest time to market.